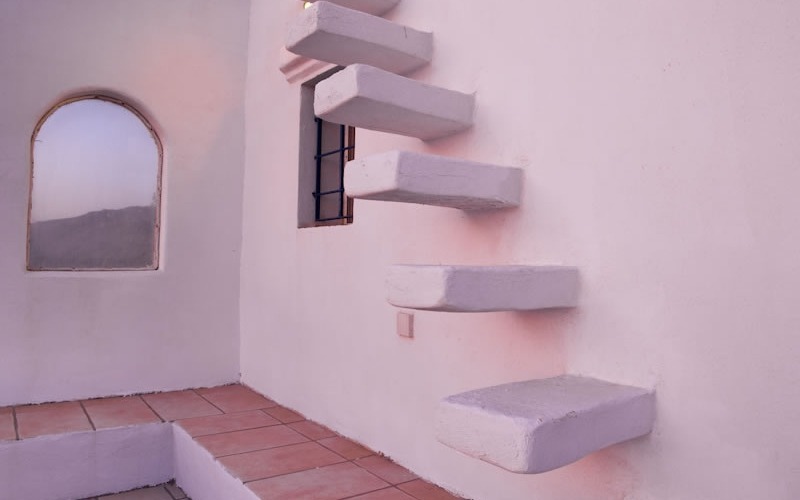 and offer full privacy and at the same time easy access to each other. 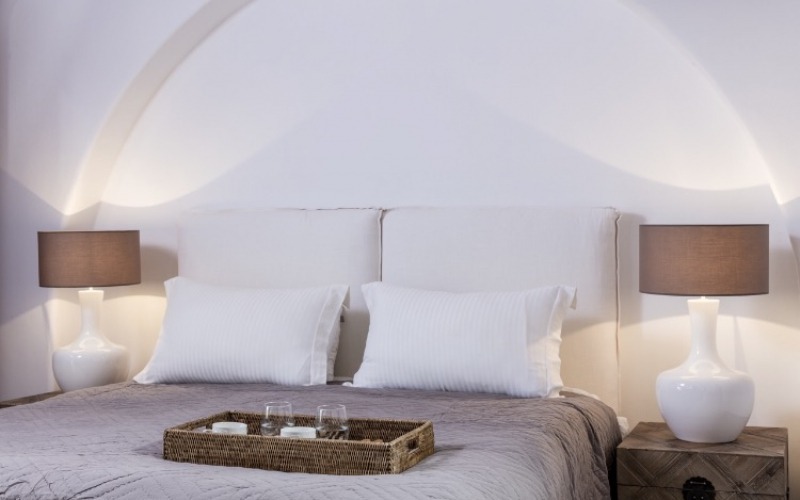 These elegant family villas are located in a privileged wind-sheltered location of the island, the Agia Sofia area. 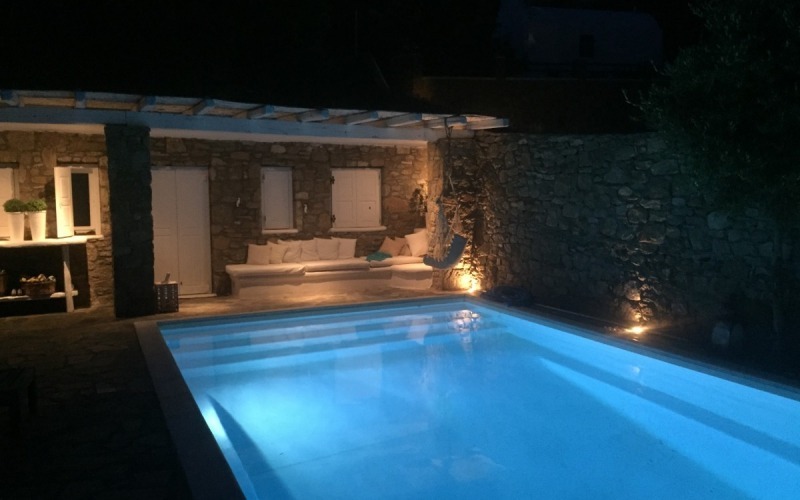 Positioned above the new port, only 2,8 km from the beautiful town of Mykonos and very close to the airport and the ports. 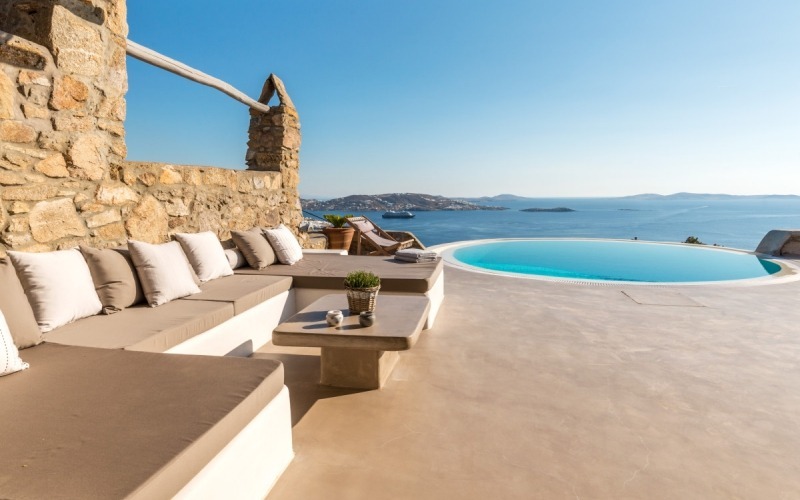 The villas are facing south offering breathtaking sunset views over the sacred island of Delos, the Aegean sea and the island of Syros. 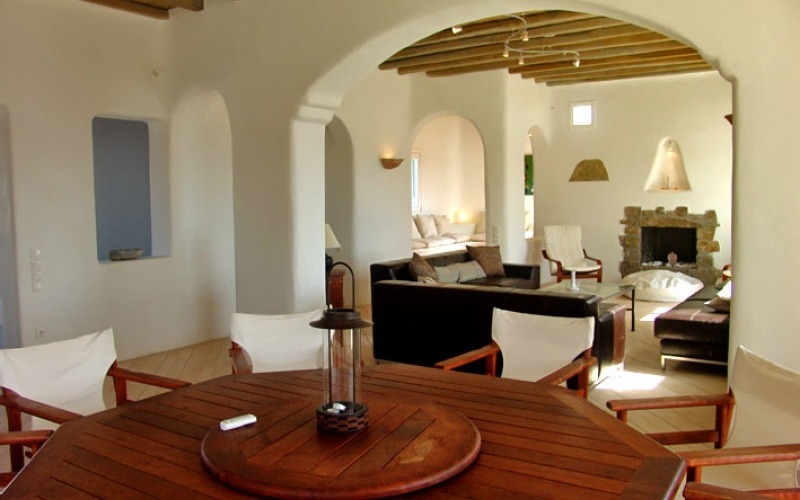 The Villas are ideal for a large family or a group of friends. 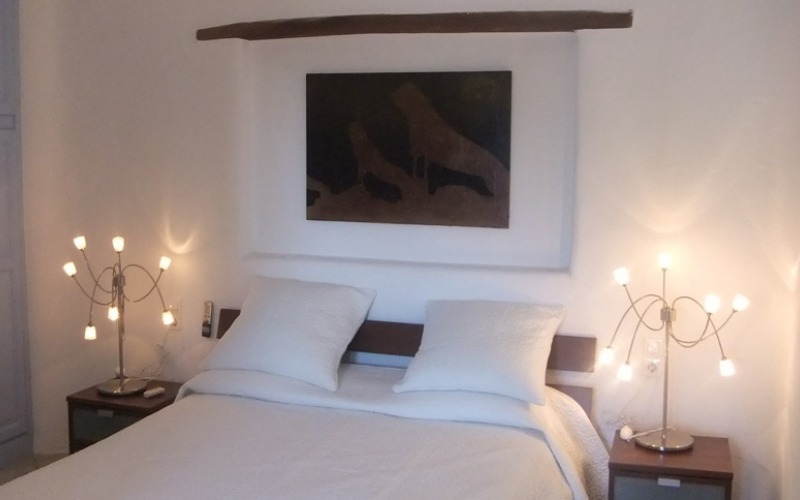 Due to the proximity of the structures they are not rented individually. 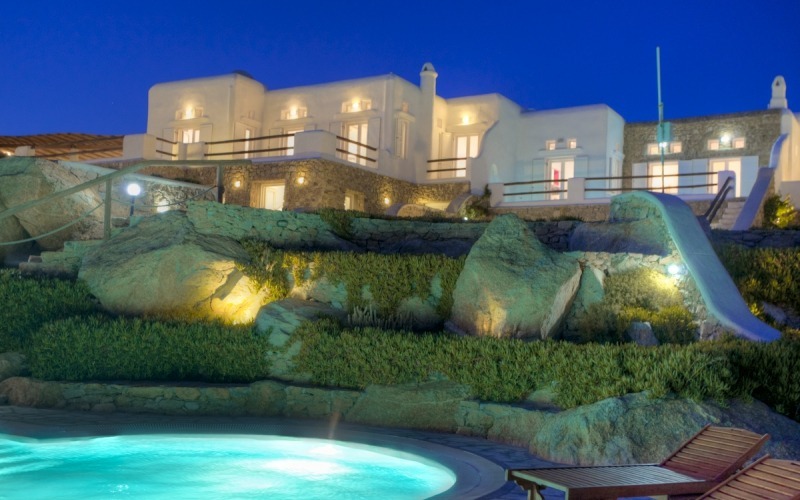 Just above the renowned beach of Super Paradise, lies a private complex comprised of three villas. 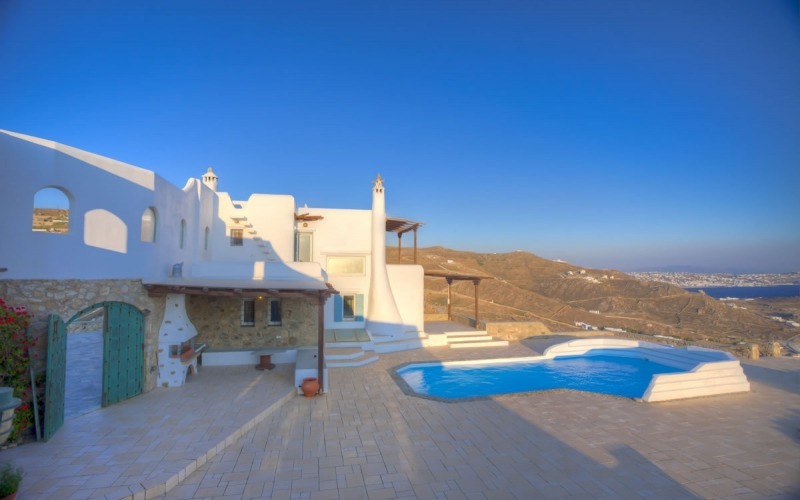 Each villa has its own infinity pool with infinite views of the Aegean Sea, a built-in spa, separate entrance and a private outdoor area with dining table, a BBQ, a bar and a state of the art sound system. 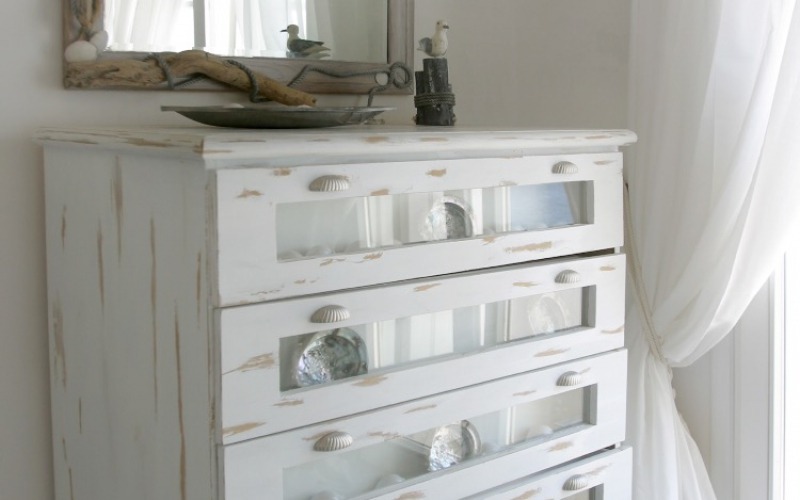 The interior is ergonomically designed with modern style and decoration. 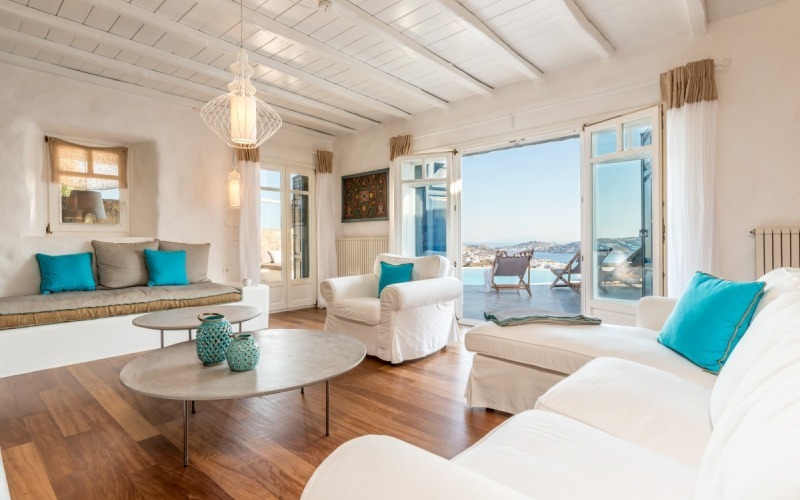 On the upper level there is a fully equipped kitchen along with the main dining room and a living room with a view to the infinite blue. 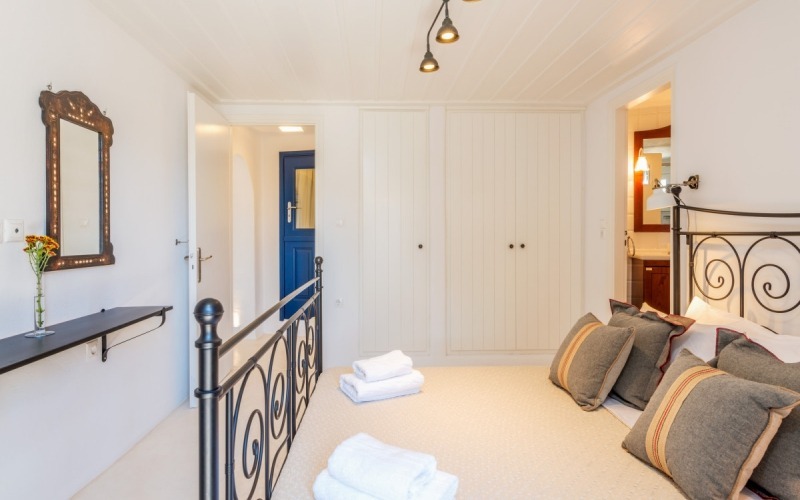 On the lower level there are five bedrooms, each with two twin beds or a double bed, en-suite bathroom, as well as direct access to the terrace. 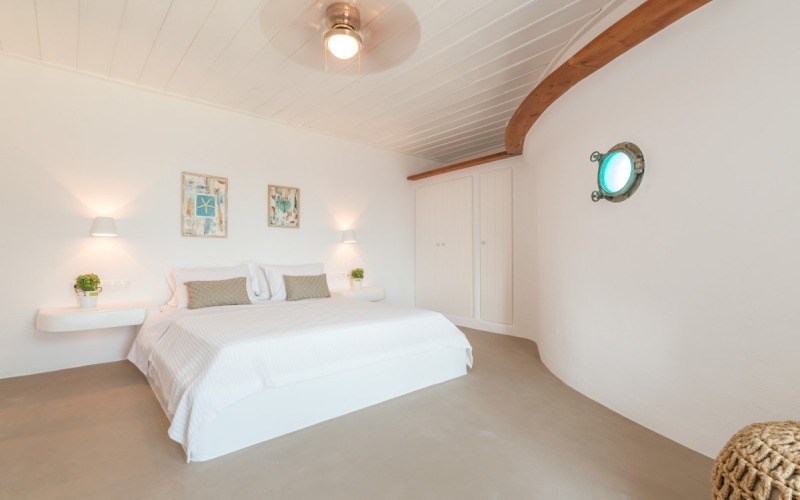 All Paradise Villas villas are ideal for a large group of friends or families that fancy spending their vacation together in a pleasant and safe environment. 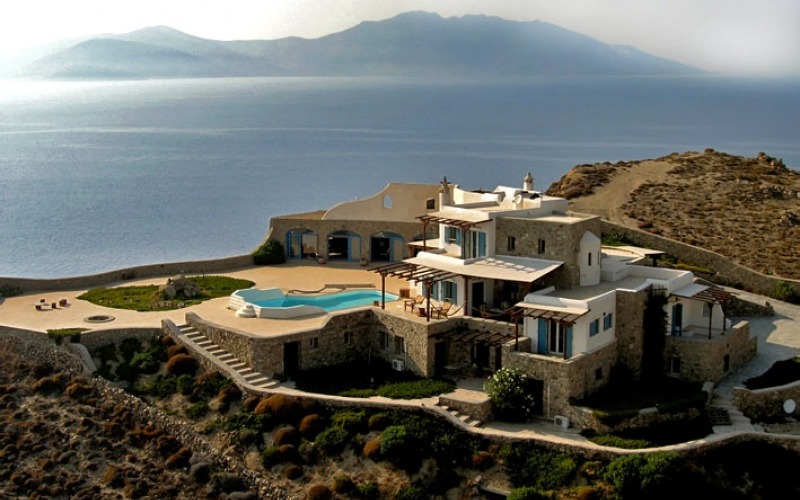 Paradise Four is a vast private property, on top of the hill in Houlakia. 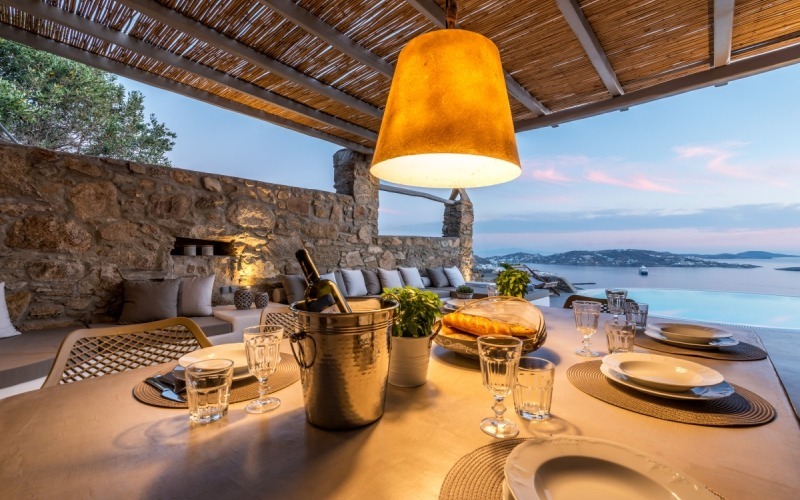 Thanks to its dominant position, the villa offers an unobstructed view to the town of Mykonos as well as to other nearby islands like Delos, Syros and Tinos. 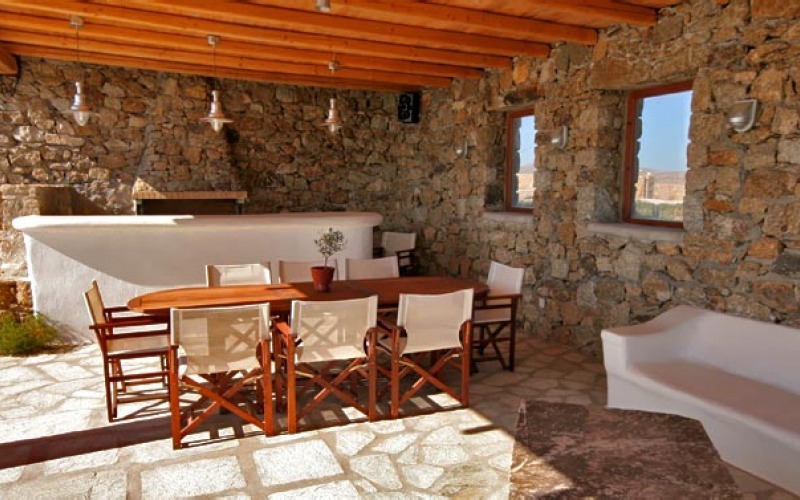 Facing westwards, the villa gives you the opportunity to watch the beautiful sunset of the Aegean sea. At nightfall, figures change dramatically as tiny lights glitter in the dark, giving life to the island. 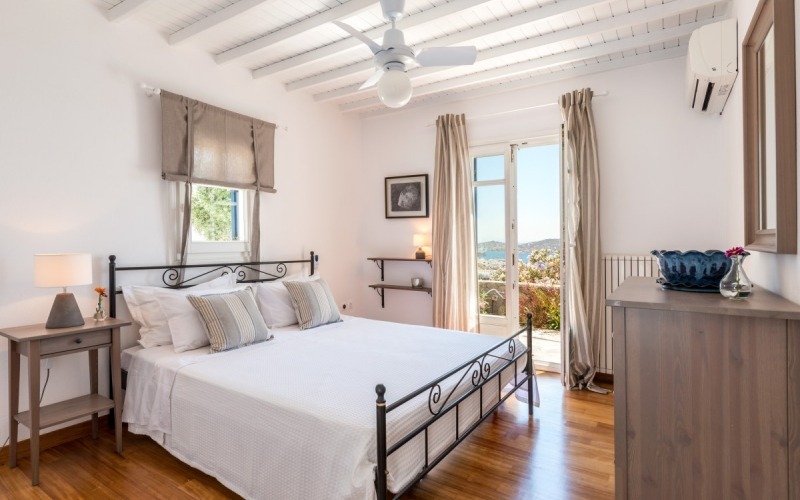 The villa is built on three levels: the lower level, contains a large living room along with four bedrooms with en-suite bathrooms and access to the garden. 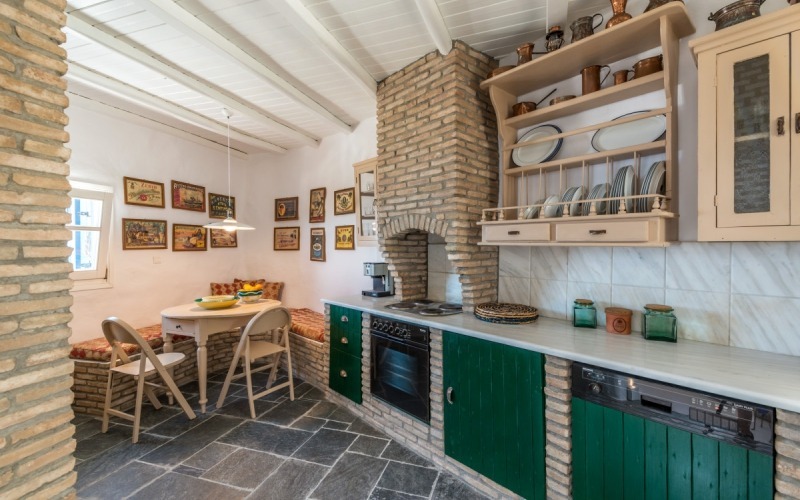 The middle level has a modern and well equipped kitchen together with the dining room, and a comfortable lounge that gives access to the terrace and the outdoor BBQ. 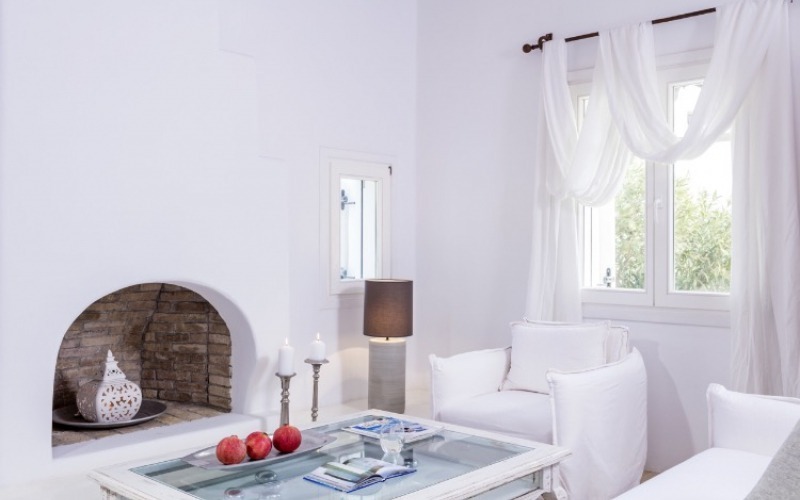 A stunning white staircase leads to the master bedroom on the upper floor, which has an amazing view of the garden, the sea and the pool. 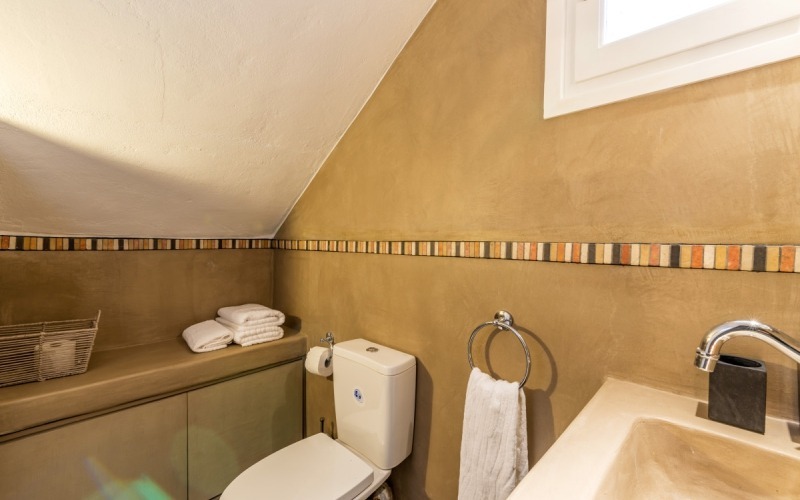 It also has a luxurious open-space bathroom with a Jacuzzi and a large double vanity. 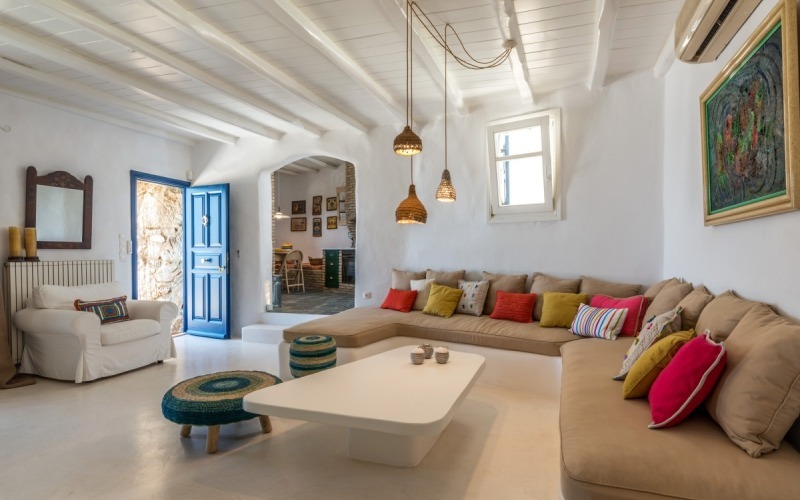 The interior of the v is a combination of joyful colors, high aesthetics, and large common spaces simultaneously yielding a traditional sensation. 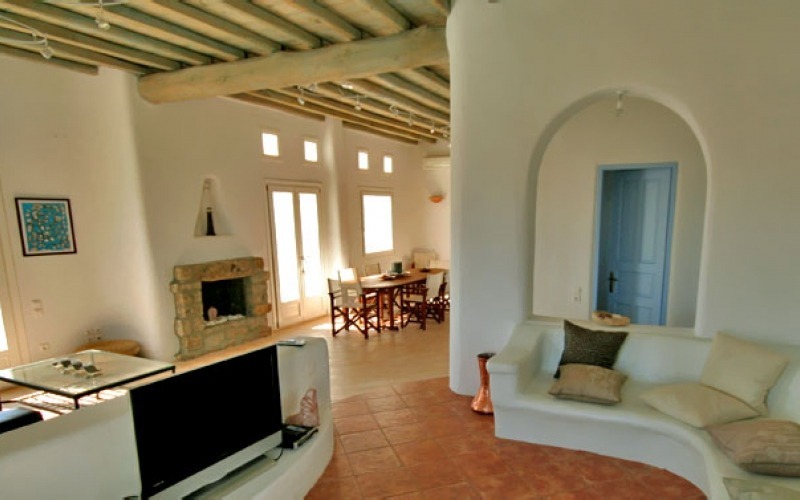 Ideal for those who want privacy, and a carefree vacation. 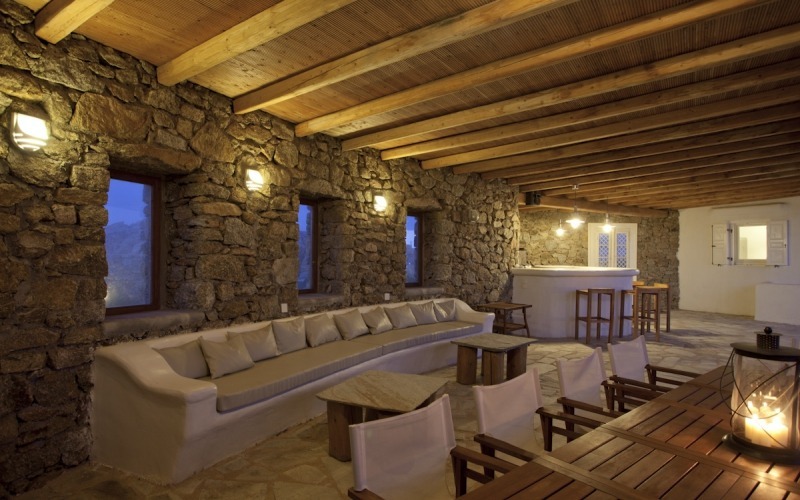 just across the ancient island of Delos, there are 8 luxury villas. 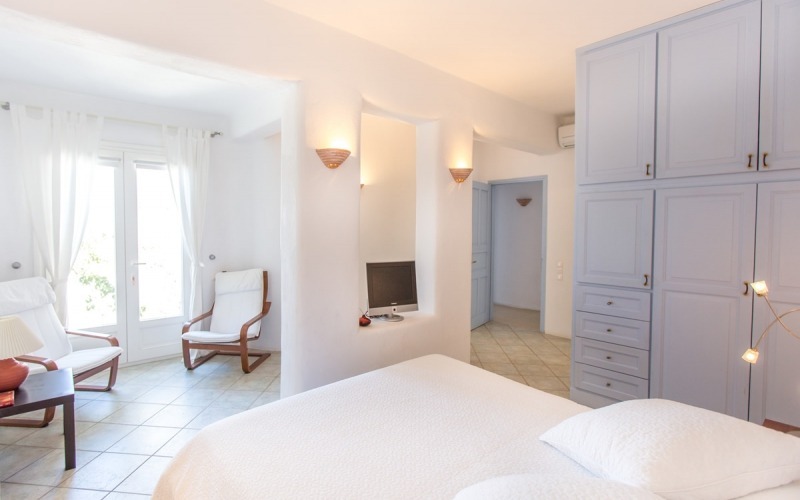 The villas benefit from direct sea view and have been recently refurnished and modernly redecorated. 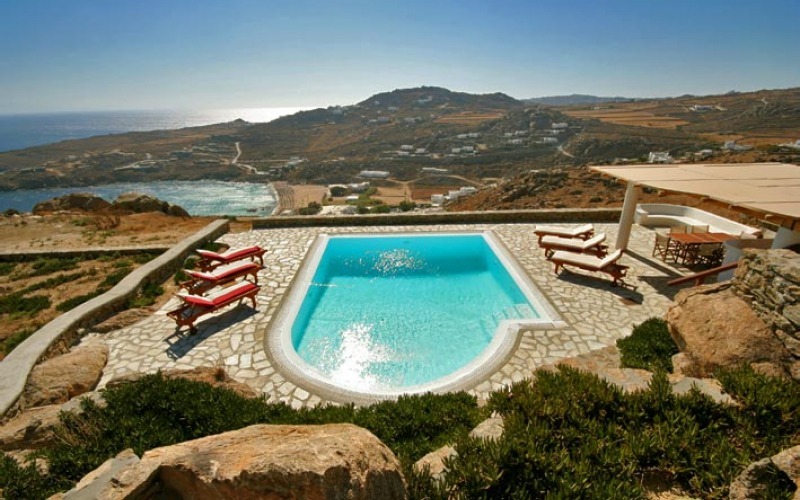 The beach below is just a 5 minute walk, a perfectly formed crescent bay protected by the force of the Aegean winds. 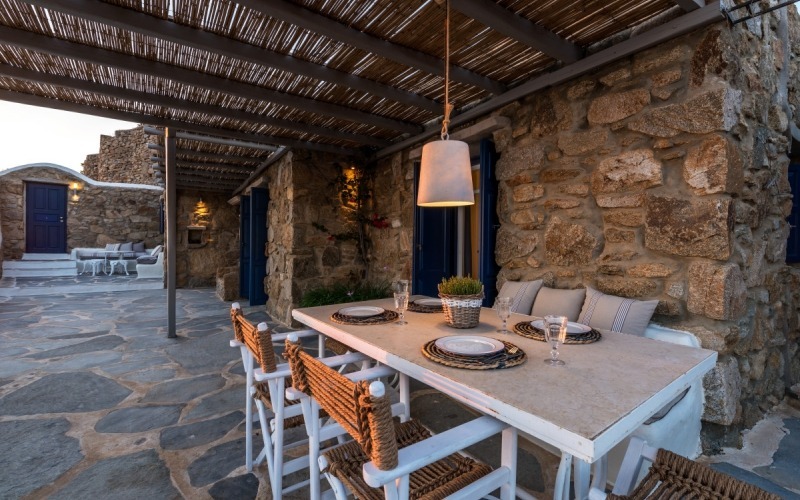 Only 3km from the capital city of Mykonos and 5km from the island’s international airport, the villas are ideally located and offer a truly authentic. 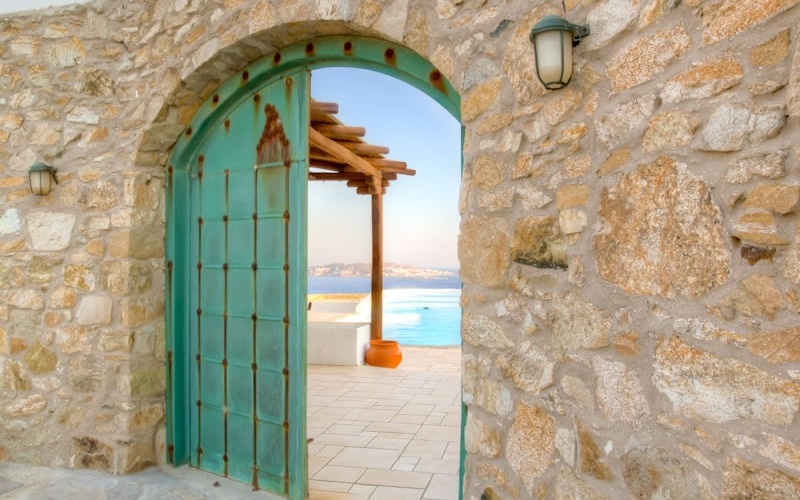 Greek experience of privacy, comfort and relaxation.